Late in January, just as the market was enjoying an unprecedented melt-up ahead of the February VIXplosion which sent the S&P on its first of two corrections in 2018, Bank of America published a warning report, titled "Our Sell Signal Was Triggered On Jan 30, S&P 2686 Is Next" in which chief investment strategist Michael Hartnett explained why he was convinced that a drop as much as 12% was imminent in the coming weeks. He was spot on, with the S&P tumbling within days, hitting hit target and then some. 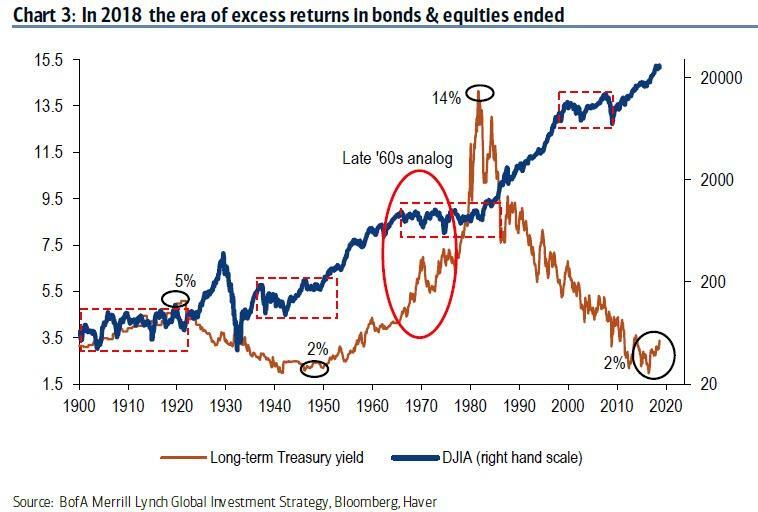 We are bearish stocks, bearish bonds, bullish commodities, bullish cash and bearish the US dollar; we expect to turn tactically risk-on in late-spring but start 2019 with bearish asset allocation of 50% equities, 25% bonds and 25% cash; coming years nonetheless less asset-friendly than past decade. But before we get into the nuances of his forecast, here is Hartnett's take on "The Year Behind", in which "the Wall St news was bullish, but the price action was bearish." …the MSCI ACWI equal-weight index fell >20% peak-to-trough, as 1,881 global stocks out of a total of 2,767 experienced bear markets. 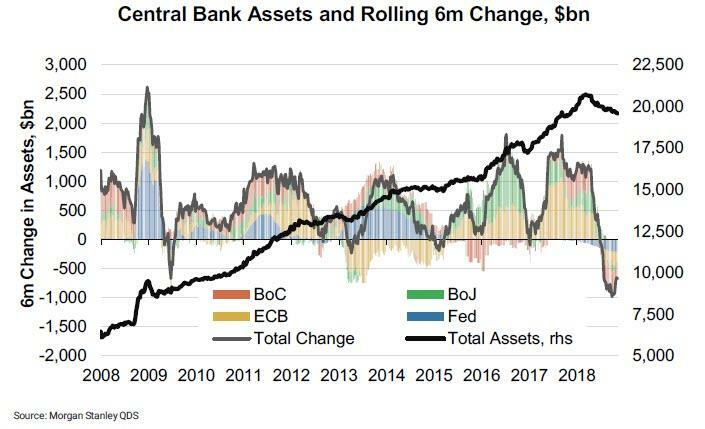 The losers (global stocks, corporate bonds, Emerging Markets), the winners (US dollar, T-bills, volatility)…basically QT-plays (Quantitative Tightening) outperformed QE-plays (Quantitative Easing). 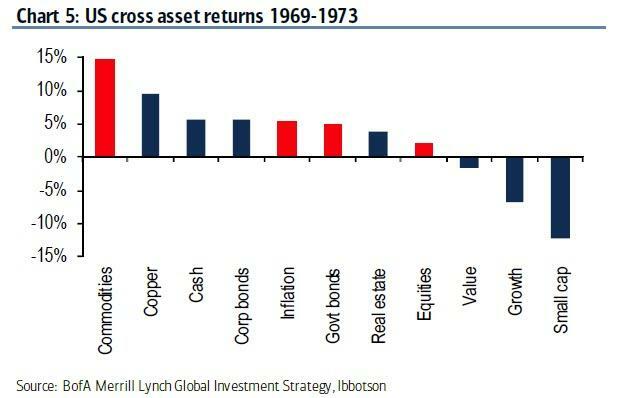 “The Icarus trade”, “US decoupling”, “trade war” were all topical; but the simple truth was asset prices & central bank liquidity growth both peaked in Q1…and following a historical period of abnormally strong bond and equity returns, prices in both asset classes have been falling together since Q1 (Chart 3). Global GDP growth 3.6%: Ethan Harris & team forecast no global recession, but notable deceleration in global growth as 2019 progresses. China GDP growth 6.1%: Helen Qiao projects a “soft landing” in Chinese economic growth, aided by further monetary & fiscal stimulus. Fed funds @ 3.5%: Michelle Meyer forecasts 4 rate hikes by the Fed; US inflation to come in just above the Fed’s 2% target. Quantitative Tightening: G4 central bank liquidity to contract by $0.2tn as ECB ends QE in ’19; but Europe & Japan rates to stay close to zero. Credit spreads to widen: supply & Quantitative Tightening to put 25-50bps upward pressure on IG & HY corporate bond spreads. Trade war: we expect near-term macro & market weakness to force the US and China into a H1’19 trade ceasefire. US$ bear: David Woo & team expect a US$ overshoot in early ’19, but thereafter a bearish year for the US$...CNY 7.0, Euro 1.25, Yen 105 by end-2019. Commodity bull: Francisco Blanch & team forecast WTI oil prices will average $59/bbl next year; Michael Widmer projects a 2% rise in copper prices; gold prices are forecast to rise and average $1,296/oz. Emerging Markets bull: David Hauner & Anne Milne expect a better year for EM debt & FX due to a weaker USD and the expected trough in Chinese economic growth. As Hartnett summarizes, BofA's 10 key calls ahead imply a backdrop of rising rates and falling earnings in 2019, and as a result "the “Baby Bear” market on Wall St that began in 2018’Q1 is not yet over." However, in a break of his traditional pessimis, Hartnett predicts that once rate expectations peak and EPS expectations trough some time in the first half of 2019, "we believe asset prices will find their low." Positioning: BofAML Bull & Bear Indicator, currently 2.8, to fall below 2.0 as institutional investors turn excessively bearish; private clients and corporations’ allocation to risk assets likely to be cut. 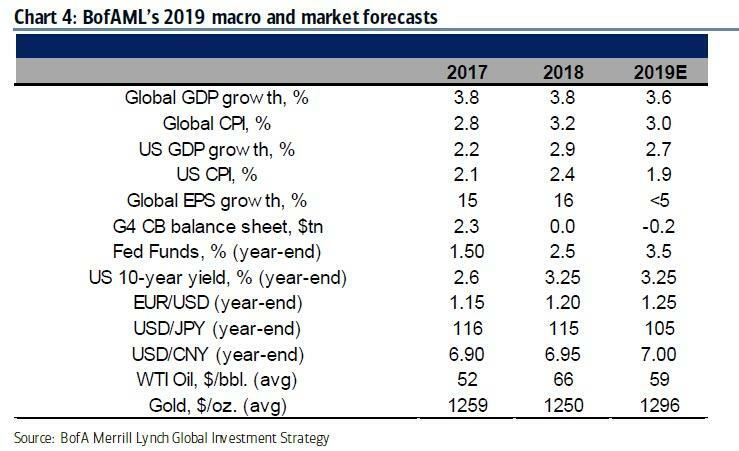 Profits: 2019 consensus global EPS forecasts reset lower from their current >10% to closer to 0% and coincide with stabilization in lead indicators, such as Asian exports, global PMIs, the BofAML Global Wave. Policy: Fed rate hike expectations stop rising, China stimulus gains visible traction in Asia, financial markets force US-China trade war ceasefire. ... and it is only a matter of time before the US central bank hints at the end of the tightening cycle. What will validate this bullish outlook? A rally in EM currencies, KOSPI, copper, and global industrial stocks would confirm China/global EPS expectations at a trough. A rally in REITs, homebuilders & semiconductor stocks would confirm Fed rate expectations peaking. Falling US rates coincide with a stronger US dollar, higher credit spreads, higher market volatility… would raise recession probability and shadow banking deleveraging fears. China eases but this fails to stimulate China & Asian growth leading to a “liquidity trap” and China devaluation fears… would reduce global GDP forecasts. Inflation and/or bond vigilantes push interest rates…stagflation fears rise. We are bearish stocks, bearish bonds, bullish commodities, bullish cash & bearish the US dollar. Our stock-bond-cash asset allocation heading into 2019 would be: 50% equities, 25% bonds, and 25% cash. ... and that populist politics will cause higher budget deficits and higher inflation risks (Chart 5 shows asset price performance between 1969 & 1973, a period with many parallels to today). As a result, Hartnett warns that coming years will be less asset-friendly, yet even so he expects to turn tactically more risk-on in late-spring, “Buy-in-May”, as positioning, profits & policy generate a good entry point. Long VXX (IPATH S&P 500): Q1 long volatility play on liquidity withdrawal, policy impotence & uncertainty, rising recession odds. Long US 2s10s flatteners: H1 play on US yield curve inversion, Fed's intention to hike 4 times in 2019. Long KBWB (KBW Bank ETF), short IAI (iShares-DJ BR DL) and PSP (Invesco Global List): 2019 "long liquidity, short leverage" play...long Main St banks, short Wall St banks & Private Equity. Long BRIC vs. short FAANG vs. QQQ (Inv QQQ Trust Ser 1): Long BRIC (Brazil, Russia, India and China), short FAANG (Facebook, Apple, Amazon, Netflix, Google) play on value outperforming growth. Long AUD/USD, long EMB (Ishares): Q2'19 play on China growth inflection, bullish commodities, inflation hedge. Long XHB (S&P Homebuilders): Play on H2'19 peak yields once Fed hikes fully priced in. Long USSWIT5: Play on global policy populism driving fiscal stimulus, infrastructure spending, wage growth. Long SX7E: The most contrarian bull trade of 2019; highest beta to "The Big Low"; ECB rate hike Dec'19.